We have had a long, wet winter and I think many of us are eagerly anticipating Spring's arrival! Once the weather cooperates, it will be nice to have some options to get outdoors and get active! One thing about Spring in Roseville, home of our very own Roseville Self Storage, is the calendar begins to fill with all sorts of events; events for the kids, for the family, and a few just for adults. Once the calendar turns to March, the activities begin! If wine is of interest, you'll want to check out the weekly Wine Down Wednesdays that start on Wednesday, April 17th. Each week you can meet different local vintners and taste some fantastic, award-winning wines. Whether you enjoy Chardonnay, Zinfandel, Barbera, a Cab Franc or a dessert wine, there are plenty of options for your taste! If local award-winning wines isn't enough to entice you to Town Square, how about some great, live music from local bands to go along with it? With only a $10 fee (which is good for five 1 oz tasting tickets), you can't go wrong!. If you return and bring your 2019 souvenir wine glass with you, you can get an additional 1 oz tasting for free. They also offer a "pour of wine" (5 oz) for only $5. If you are interested in attending all 6 Wine Down Wednesdays, consider getting a season pass. For $50 your season pass includes entrance to all 6 Wine Down Wednesdays, and, of course, your souvenir wine glass, a savings of $10. If you want to really enhance your experience, you can rent a Cabana (seats 6) for an additional $25. I attended this event a few times last year and really enjoyed it so I will definitely return this year! 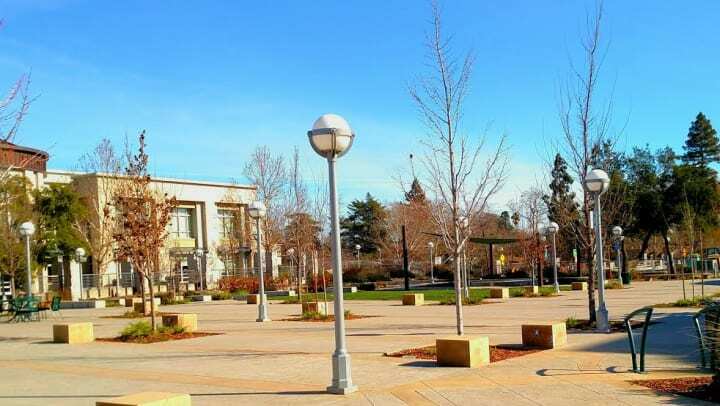 My only complaint about this new(er) spring addition to the Roseville Town Square calendar, is it only runs for a 6 week period of time, wrapping up on May 22nd, so mark your calendar now! Back by popular demand is the monthly Food Truck Mania at Town Square. This is a monthly event on the second Thursday of the month and runs from 5pm - 8pm. Each month will feature food trucks offering a variety of options. Grab the family and come hungry! Monthly, starting in April, this free, fun family event is a must! Grab the kids, your lawn chairs and blankets and head to Town Square! A different family flick will be shown each month, The movie is free and concessions are available for an additional cost. The showtimes will vary so check the city website for details. Seeking Harry Potter Fans! Vernon St Town Square turns to Hogwarts Square on Sunday, May 5th for The Wizard Fun Run. Get dressed in your costumes and get ready to walk or run this 5K magical course. There is a group warm up at 8:30am with a 9am start time. All walkers/runners will receive a Bib and medal. This is a great family event! Friday, May 10th will be the 23rd Annual Mayor's Cup Golf Tournament and will be held at Woodcreek Golf Course. This annual event raises funds for the youth sports scholarship program. This program provides scholarships for qualifying families to participate in Parks and Recreation programs like summer swimming lessons and youth sports. Roseville Mural Project - The last public art project in Roseville was over a decade ago so I am so glad to see this project coming this Spring! This project is led by Blue Line Arts and the Downtown Roseville Partnership. This project will create 5 new murals on the walls of local businesses, all within Roseville. Blue Line Arts is seeking design proposals for the two-dimensional outdoor murals. For mural locations and proposal information see BlueLineArts.org. Roseville Self Storage is your local neighborhood self storage facility. We have locations throughout California and are part of a larger self storage company, Smart Self Storage. If you find yourself trying to find room for your summer or sports gear, consider using our self-storage facility to provide modern storage and easy access. Stop by and say "hi" today!